Most people expect their drinking water to be safe and colorless. Some water sources, however, appear to have a yellow or brown color to them that does not settle out, like that from iron discoloration. At times, the color may not be noticeable in a drinking glass, but it is noticeable when a tubful of water is drawn for a bath. Many times this is a result of the presence of tannin. Tannins are a group of water soluble, natural organic compounds that are produced by metabolism of trees and plants, and are part of the degradation-resistant fulvic acid materials formed during the decomposition of vegetation. Tannins can create a yellowish to brown color in water, and are the product of microscopic colloidal particles of high molecular weight that carry a slight negative charge to them. Tannins can occur in almost any water source where large quantities of vegetation have decayed. Generally, this occurs in regions with marshlands, peaty soils, or dense forests. In the United States it is more likely to be found in the Northeast, Southeast, Northwest, and Great Lakes Region. 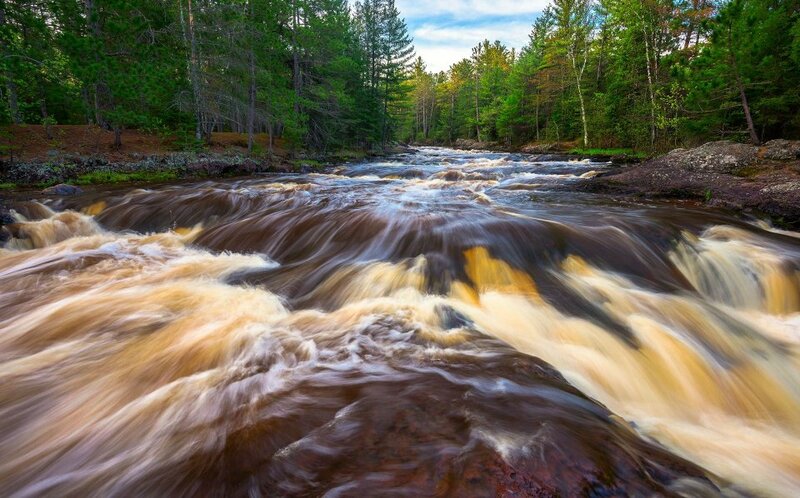 The rootbeer colored water of the Amnicon River in northern Wisconsin is caused by tannins from the decomposition of wetland plants. There are a number of treatment options to remove tannins from drinking water. Before making a recommendation, it is important to test and analyze a sample for the best treatment options. The first option is through membrane filtration. Ultratfiltration (UltraPro) membranes can be used. Membrane filtration is dependent on the molecular weight of the tannins. The membrane functions as a filter to separate the tannin molecules from the water. When high molecular weight tannins are present, ultrafiltration is an excellent treatment option for color-free water. The Master Water Conditioning UF PILOT STICK makes pilot testing for tannin reduction via ultrafiltration a quick and easy process. It also serves as an excellent demonstration tool to show customers the quality of treated water they can expect first hand. The colored sample on the left is a sample with tannin in it. 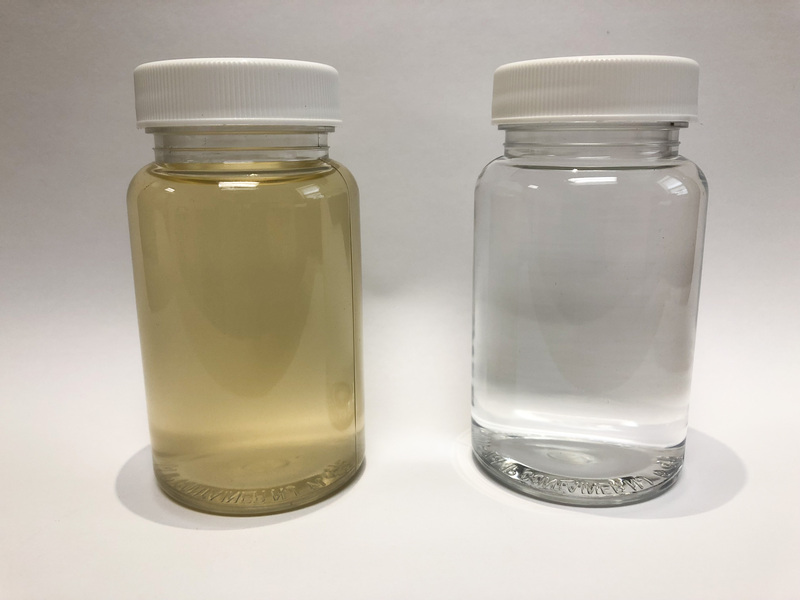 The sample on the right was treated with a Master Water Conditioning UltraPro ultrafiltration unit. The second treatment option is ion exchange. Tannin molecules carry a negative charge and therefore require an anion resin, rather than the more common "softening" resin. Ion exchange tannin units functions similarly to a typical cation exchange softener, and can be regenerated with a salt (NaCl) solution. Tannin resins more specifically differ from other anion exchange resins in that they are specifically designed to achieve some adsorption of tannin molecules as well. During regeneration, the tannin molecules are exchanged with chloride ions on the resin surface, as opposed to typical cation exchange softeners that exchange sodium for other cations like calcium, during regeneration. Often times, anion-exchange tannin removal units require some form of pre-treatment (i.e. cation exchange softener/filter). Therefore, they are typically installed as a "water polisher". This is a result of the characteristics of anion resin, and dependent on the water chemistry. Tannin resin systems often require pH correction after the equipment. Since the tannin resin is an anion resin in the chloride form, it will reduce the total alkalinity of the water. Since said resin does not reduce the free carbon dioxide of the water, reducing the total alkalinity of the water causes a decrease in the treated water pH. Tannin resin will typically reduce the pH of the influent water by around 1 pH point. A third treatment option is activated carbon filtration. Activated carbon can typically only adsorb very large molecular weight tannins. Therefore, it is the least broadly applicable treatment option. However, it benefits from typically lower total system costs, and lower maintenance (as compared to ion exchange).